After 36 years, the Golf is still going strong as evidenced by the all-new and improved seventh-gen model. The latest version of the German automaker&apos;s best-selling car has just debuted in Berlin and VW claims that the redesigned Golf brings "new levels of comfort, practicality, safety and efficiency to the class." Before going into any further detail, we want to point out that this is the European-spec model. The exterior and interior are nearly identical to the upcoming US version, but engine options will likely be a bit different. Euro customers will have a variety of engines to choose from, including a 1.2-liter TSI gasoline engine with 85 horsepower, a 1.4-liter TSI with 140hp, and two diesel options: a 1.6-liter TDI with 105hp and a 2.0-liter with 150hp. More than likely, the 2.0-liter oil burner will once again be available stateside and hopefully the aging 2.5-liter inline-five will be dropped entirely in favor of a new 1.8-liter turbo four-banger. Transmission options will also likely carry-over, such as the optional DSG dual-clutch unit. A five-speed manual will likely remain standard. 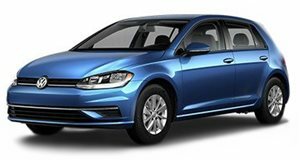 Aside from its larger overall dimensions inside and out, the new Golf is 220 pounds lighter than the outgoing model thanks to VW&apos;s new MQB architecture and its high-strength steel construction, the use of which has gone up from six to 26 percent. As a result, fuel economy will also be improved, but VW hasn&apos;t released official US numbers. The exterior design is clearly evolutionary and not overly different than the current model, but it now looks sleeker and more streamlined, mainly because the wheelbase has been stretched with shorter overhangs at both ends. It&apos;s also wider and lower which helps to give the hatchback a sportier appearance. VW points out that these new proportions result in an improved crash structure. In addition to having more cargo space, both front and rear passengers benefit from increased knee and shoulder room. One new interior feature is an infotainment system that incorporates a five-inch touchscreen that&apos;s standard even on the Euro-spec base model. The top level Golf has an eight-inch touchscreen with a navigation system. Nothing has been announced regarding pricing, but further details will surely come soon. For now, enjoy the photos and let us know what you think about the Golf&apos;s updated design both inside and out.